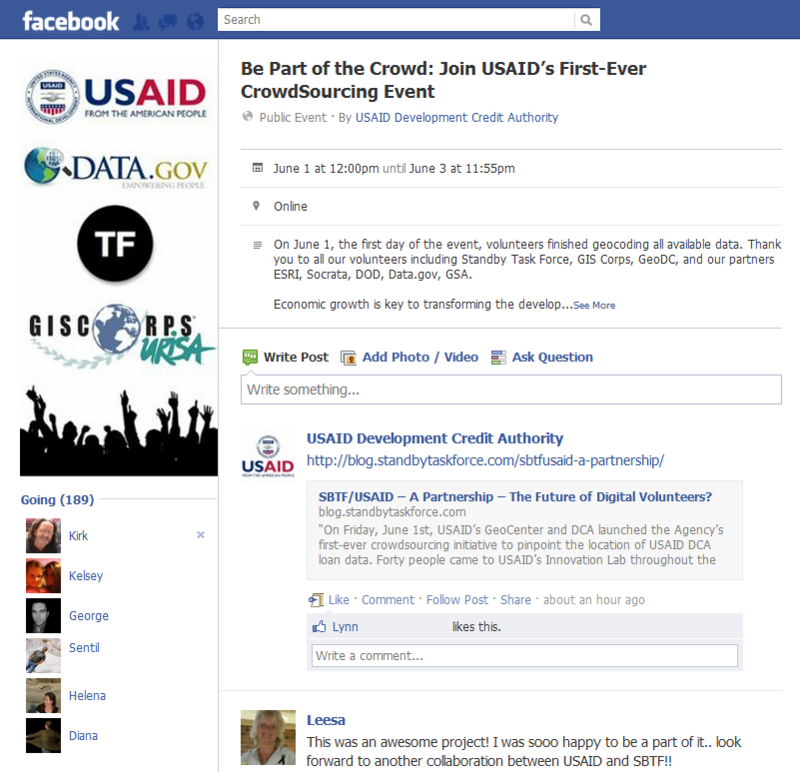 Home › ALL POSTS › SBTF/USAID – A Partnership – The Future of Digital Volunteers? 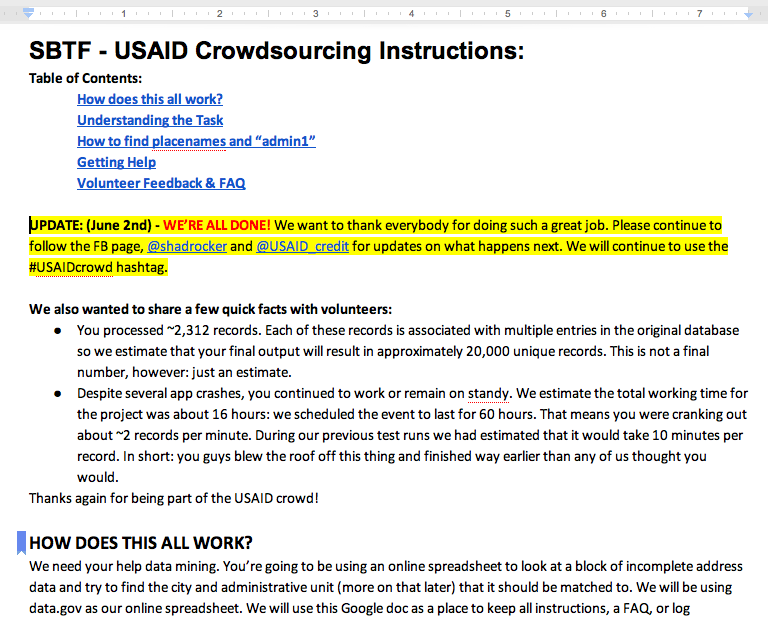 SBTF/USAID – A Partnership – The Future of Digital Volunteers? 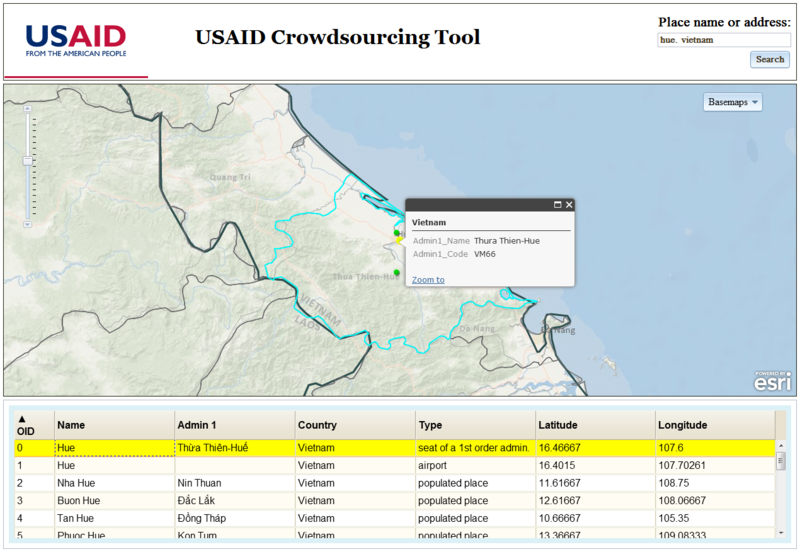 “On Friday, June 1st, USAID’s GeoCenter and Development Credit Authority (DCA) launched the Agency’s first-ever crowdsourcing initiative to pinpoint the location of USAID DCA loan data. 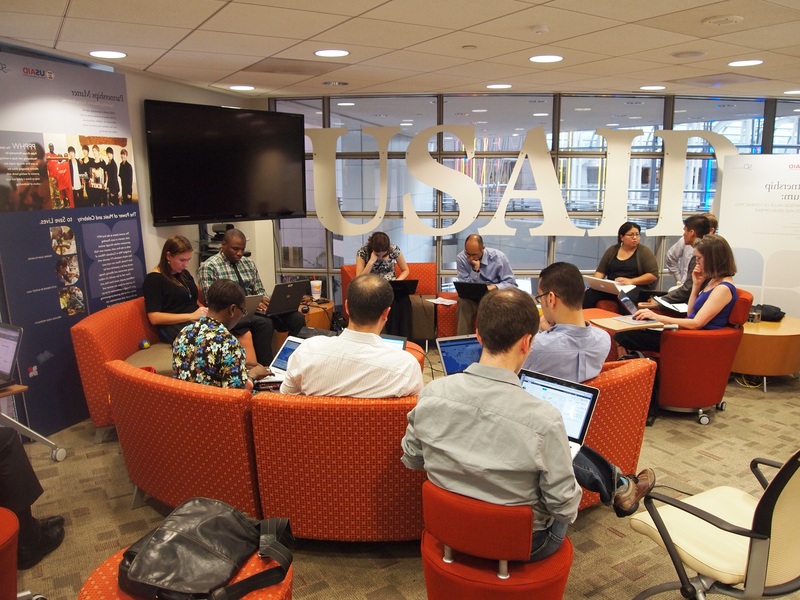 Forty people came to USAID’s Innovation Lab throughout the day to crowdsource live. Online volunteers, working from Canada to the United Kingdom to Uganda, worked nonstop until the project was complete. The event, which was planned for the entire weekend, concluded after only 16 hours as the first 150 people completed 2,300 records. Each of these records is associated with multiple entries in the original database so the final output from the volunteers will result in approximately 10,000 unique records. The event relied heavily on partnerships from online volunteer communities – the Standby Task Force and GIS Corps who both brought many volunteers and leaders to the table. 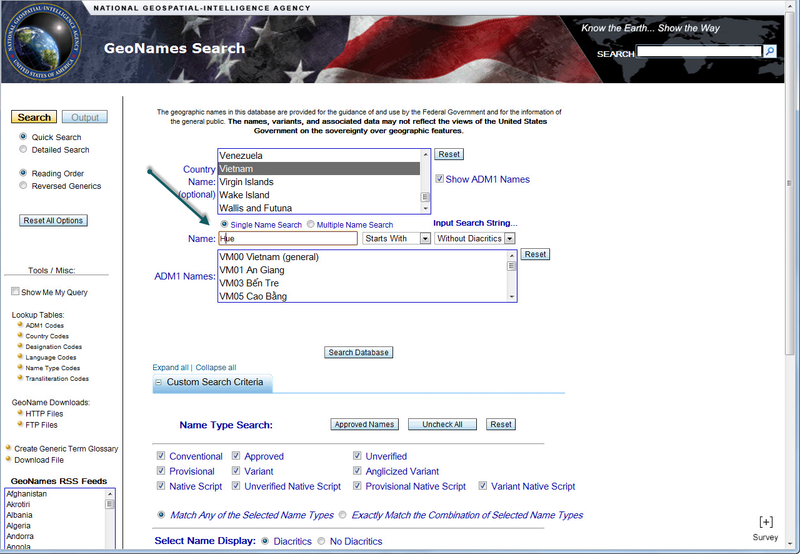 These records are part of a larger dataset containing over 100,000 records, 70,000 of which were automatically geocoded in collaboration with the Department of Defense. The initiative took place using the data.gov platform, manipulated for the first time as a crowdsourcing tool.” – Shadrock Roberts, USAID. We have immense respect for the heavy lifting done by Shadrock Roberts and Stephanie Grosser of USAID. Walking through the Government bureaucracy and legal hurdles required tenacity and patience to bring the effort to fruition. Appreciation must also be shown to the many unknown Government workers who contributed in making the collaboration possible. This effort represents a significant view of the future for digital volunteers. As open data becomes more readily accessible, a wealth of information becomes available to be used for good. We were also impressed with the response to the call for volunteers from the global (“crowd”) public. They proved to be wholly reliable, competent and committed to the event as much as the seasoned volunteers. A major lesson learned is with proper work flows, instruction and experienced guidance the “crowd” is an extraordinary asset we all have to learn to trust. Trust is an element that can’t be passed by casually. Establishing it has required effort, diligence and dedicated volunteers who take pride in the veracity of their efforts. This long road began with UN OCHA, Andrej Verity and the Colombia team (@ochacolombia). Along the way we made incremental advances with UNHCR, WFP, WHO, Amnesty International USA and the Harvard Humanitarian Initiative. And now a working partnership with USAID made possible by an effort of two-and-a-half years of dedicated membership. The future is bright for mapsters and open data. “The crowdsourcing event was implemented at no cost to the Agency and is paving the way for the USG [US Government] to allow an interested public to play a role in our efforts to open more data. 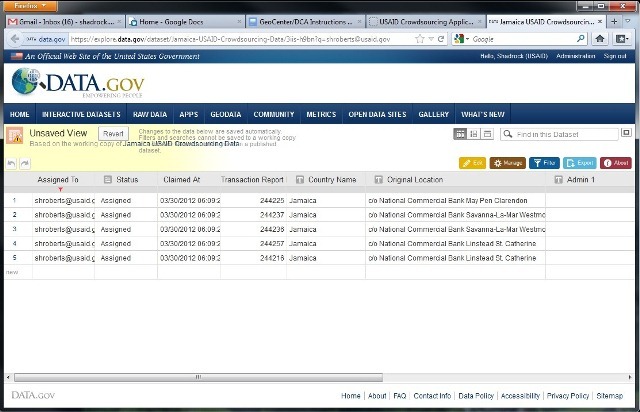 The substantive effects of the released data and maps will change the way our partners work with DCA in the future. After reviewing the data for quality control, the complete dataset, case study, and the associated map will be released and presented at the Woodrow Wilson Center for International Scholars on June 28th.” – Shadrock Roberts, USAID. Volunteers processed more than 2,300 records in approximately 16 hours. Many of these records have been used to populate multiple entries in the original dataset (where there were multiple entries only one “parent record” was given to the volunteers). At present, USAID has been able to complete 8,615 records from the work of the volunteers! They are fairly confident that the final number will be around 10,000. Only 2,393 records were labeled as “bad data,” which can still be mapped at the national level. Of the ones that were “completed” over 4,000 of them returned a good enough placename match to be assigned a latitude and longitude point. 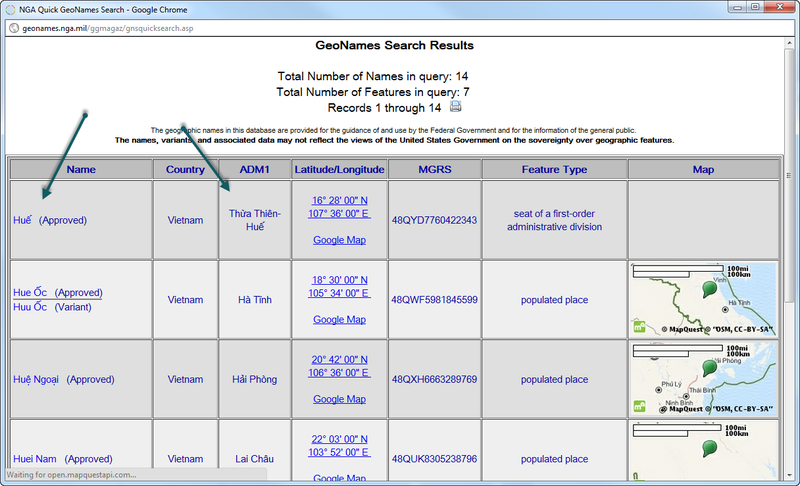 The first phase of using crowdsourcing to geocode the data records and perform data cleansing is now complete. Phases 2 and 3 of the project are now being performed by USAID and GISCorps. 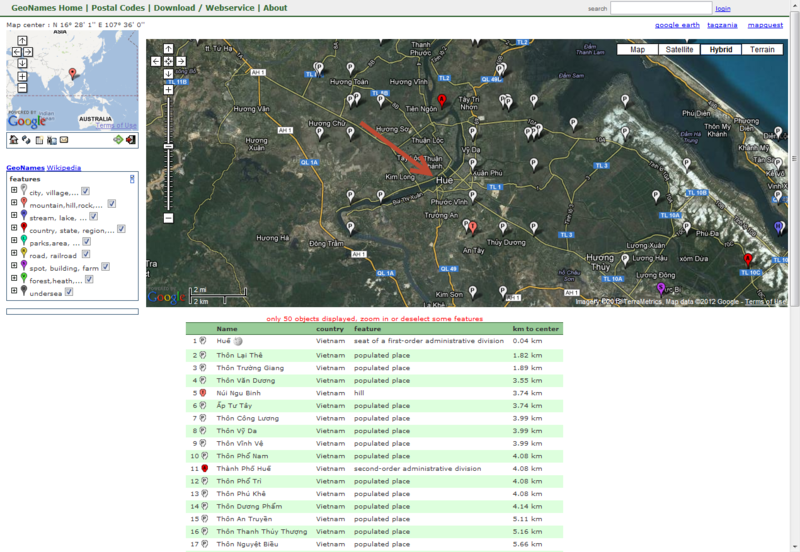 During Phase 2, “hard-to-geocode” records are being worked on further by GISCorps volunteers who have specialized expertise in geolocation and writing automated scripts to perform these tasks. 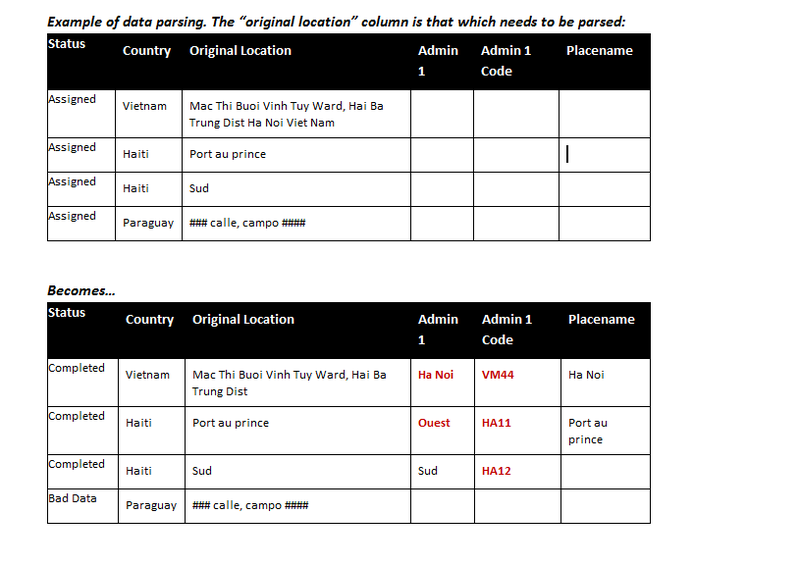 During Phase 3, quality control and analysis of all geocoded records will be performed, meaning the geocoding of data by both the “crowd” and automated systems will be checked for accuracy. Once these phases are finalized, the complete data set, map and case study will be released to the public, promoting open data and transparency. [6/2/2012 5:10:57 PM] Rick: I work in the field of Environmental science, with work also in Toxicity, Exposure, Epidemiology and Risk Assessment. [6/2/2012 5:14:00 PM] Joy: Thank you Richard. Get out of town I worked for a bio montoring lab all through my under grad +5 years aquatic toxicology for NELAP compliance. I tried really hard to selll my boss on creating a GIS for his clients he just didn’t see the value in it so it was time to leave. [6/2/2012 5:18:30 PM] Joy: Richard you did lots of good today and you can feel good about that. [6/2/2012 5:19:26 PM] Rick: I do. I haven’t felt like this since the soup kitchens and food drives I used to do in college. I love this. Below are a list of some of the tools we were fortunate to have at our fingertips for this event, including Rabble, a custom-built microtasking application designed specifically for this crowdsourcing event by Socrata, a leader in open data helping to make Kenya a leader in the open data movement. This app enabled volunteers to request records from the US government’s open data site, Data.gov. Here the members were presented with the data records. Using various tools, including search engines and online maps, combined with much investigation and detective work, the volunteers were able to mark the data record as complete or as bad data. 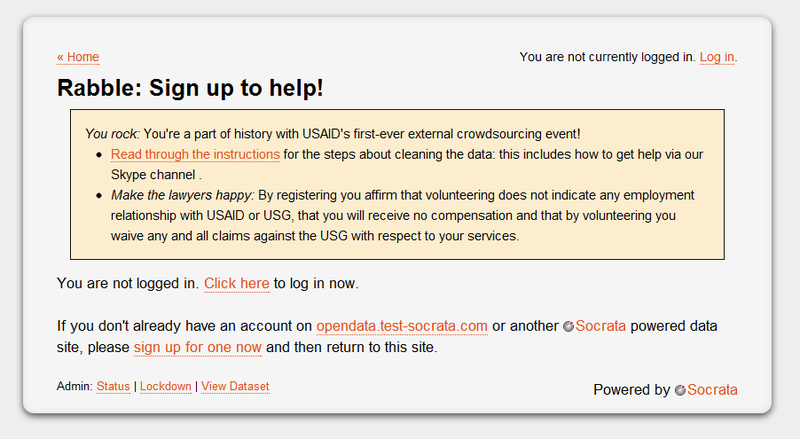 ESRI developed a tool just for the USAID crowdsourcing event to aid volunteers in their search for good location data matching the record. 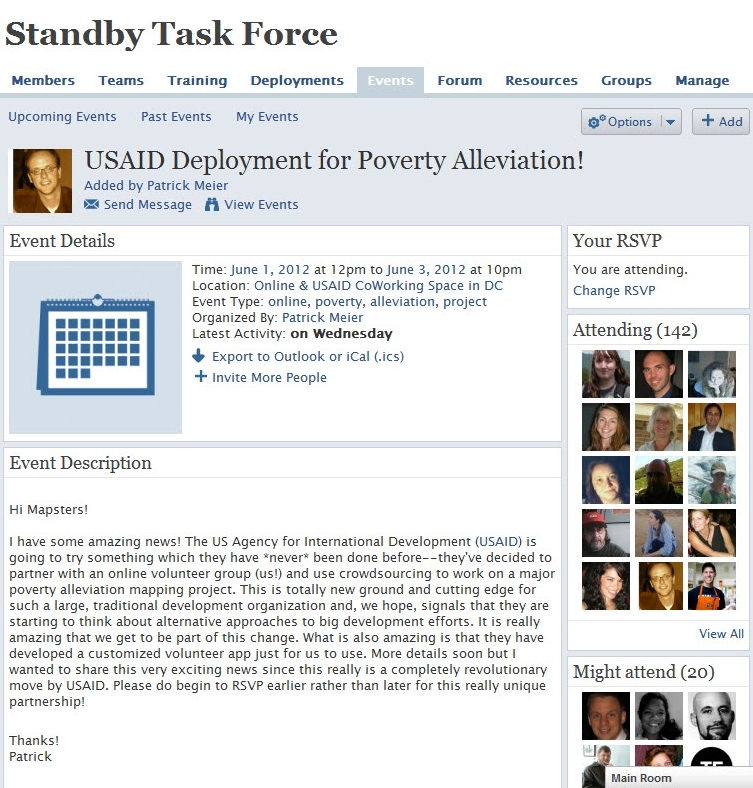 1 Pings/Trackbacks for "SBTF/USAID – A Partnership – The Future of Digital Volunteers?"